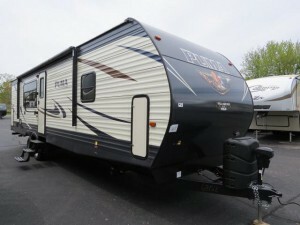 There are a lot of advantages to owning short fifth wheels. They are generally easier to tow since they are lighter, they are cost-effective and are great for those only looking to camp with a few people. 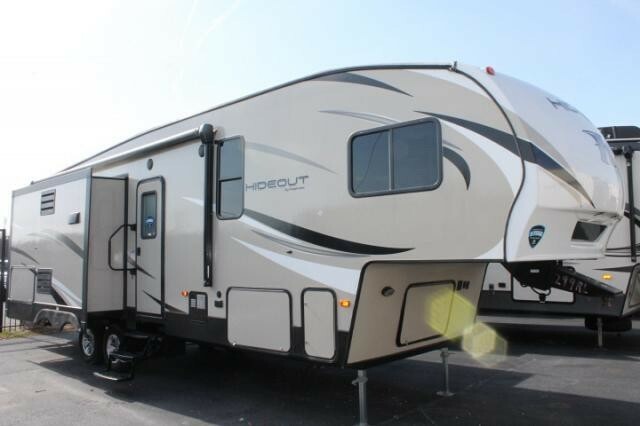 You don’t see small fifth wheel campers everywhere, but there’s enough to keep you wondering which are the best! 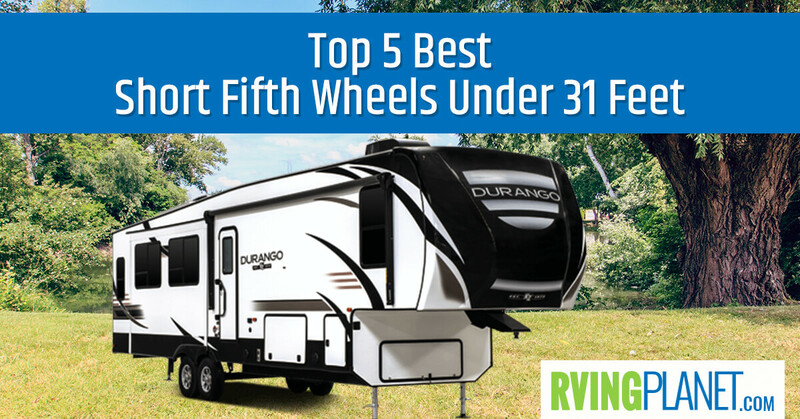 To help you with that, here are the top 5 best short fifth wheels under 31 feet. 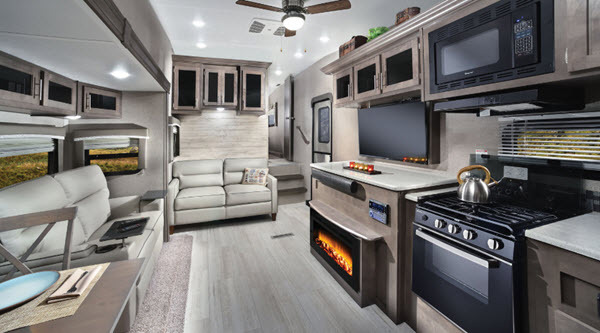 What puts an RV on the list: Amongst a handful of short fifth wheels under 31 feet, we handpicked the ones with good reviews, maximum number of floorplans and a great featureset to make your camping experience a memorable one! 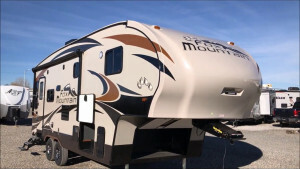 Why we recommend the Forest River Rockwood Ultra Lite Fifth Wheel fifth wheel: Tipping the scales somewhere between 7,000 and 9,000 lbs, the Rockwood Ultra Lite by Forest River lives up to its name, especially when considering fifth wheels. 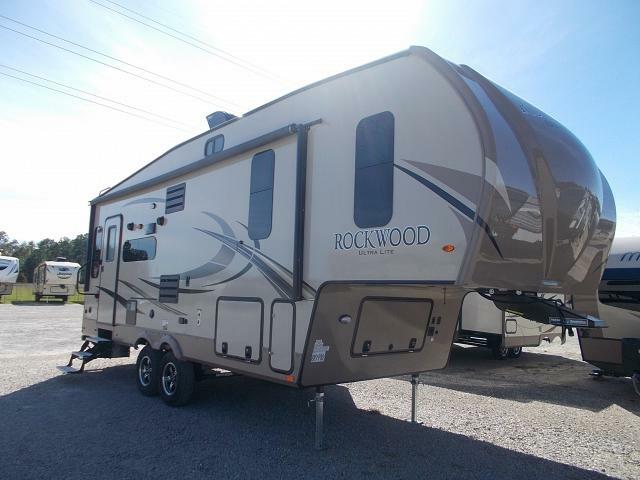 We recommend checking out the Rockwood Ultra Lite 2441WS and the Rockwood Ultra Lite 2440BS floorplans. 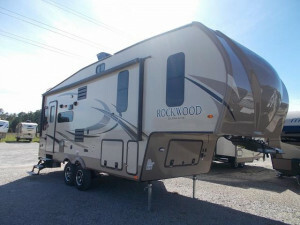 Of a plethora of the features that the Rockwood Ultra Lite fifth wheel brings to the table, the one that impressed us the most is the Stalewood interior that’s present in many other Forest River fifth wheels and looks absolutely phenomenal. 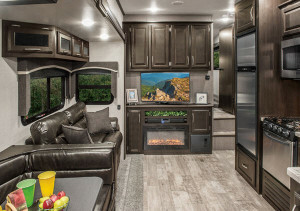 Looks aside, it has many tailgating features that include exterior speakers and rear ladder, overlooking an equally long list of available expansions, which we recommend checking out by clicking on the link below the RV images! 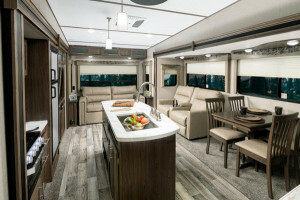 Why we recommend Palomino Puma fifth wheel: Palomino’s Puma fifth wheel has proven itself to be just as good as its travel trailer variant, as we’ve featured it in various posts such as Top 5 Best Fifth Wheels With Outdoor Kitchens. 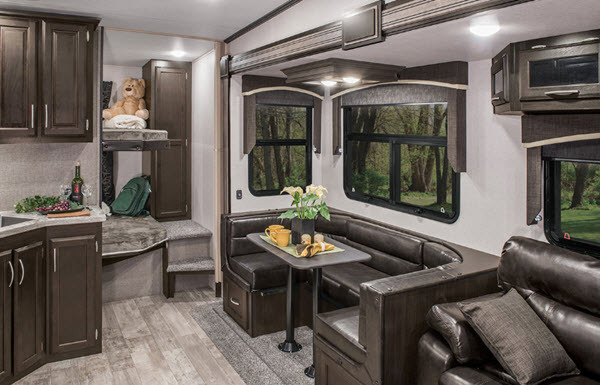 Both of its floorplans, the Puma 253FBS and the Puma 255RKS is just a bit over 27 feet and just shy of 7,000 lbs, making them super light, easily towable and of course, fit to be in most campgrounds throughout the US! While the difference between the Puma travel trailer and the Puma fifth wheel is the staggering number of floorplans on the former, they’re both equally good at providing quality features. Among the short fifth wheels that we’ve covered so far, the Puma proves itself as a cut above by including amenities such as a sound bar with internal subwoofer, super deep overhead cabinets, 35,000 BTU furnace among others! 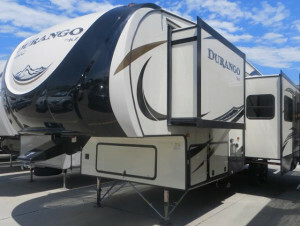 View All KZ Durango 1500 Fifth Wheel Floorplans! Why we recommend KZ Durango 1500 fifth wheel: While shorter floorplans are generally made with small families in mind, you can certainly bring a few more people than you’d expect with a Durango 1500. Floorplans such as the Durango 1500 D259RDD and the Durango 1500 D251RLT sleep more than 4 people because of their spacious slide outs! Don’t let the small size convince you that the Durango 1500 has cut a few corners. From the 15,000 BTU AC to the stainless steel double bowl sinks, it has everything you would expect from a 35+ feet fifth wheel. You can take it up a notch with their available features as well, which includes but is not limited to an extra TV in the bedroom, upgraded mattress, theatre seating and convection microwave! View All Northwood Mountain Fox Fifth Wheel Floorplans! 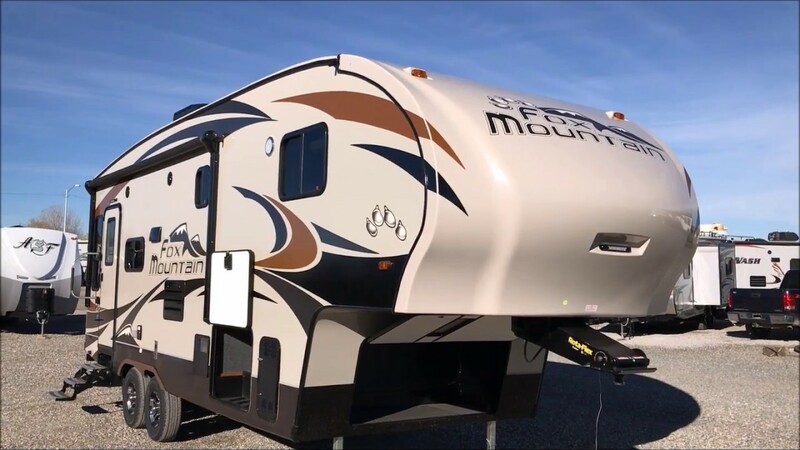 Why we recommend the Northwood Fox Mountain fifth wheel: Both of Northwood’s Fox Mountain fifth wheel floorplans are under 31 feet. The Fox Mountain 235RLS and the Fox Mountain 255RKS are 27 feet and 29 feet long, respectively. These weigh between 8,000-9,000 lbs in dry weight, so you will need a towing vehicle that can manage. 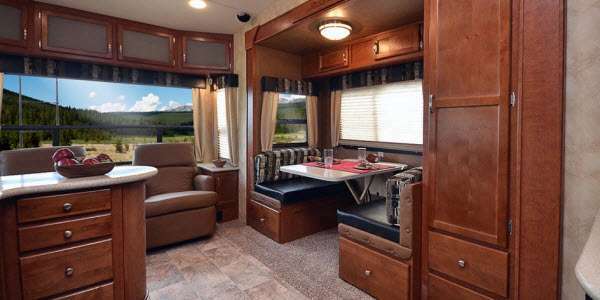 It’ll be worth it once you read the features below and realize why it’s one of the best short fifth wheels under 31 feet. In relation to features, you’ll find the Mountain Fox to be expandable, well-built and made for people looking for quality short fifth wheels. 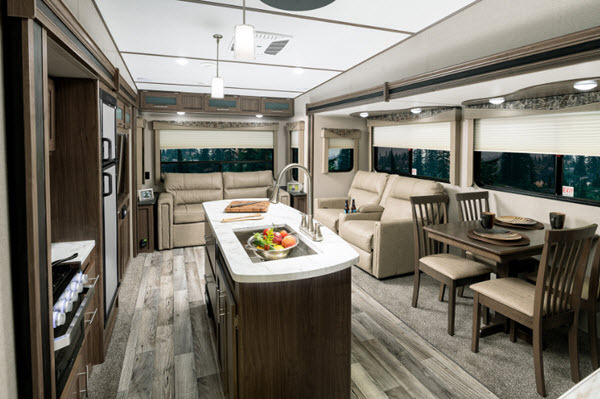 From the high density foam insulation to the additional packages that add further weather resistance, it is also great for those who aim on camping throughout the 4 seasons with their fifth wheel. 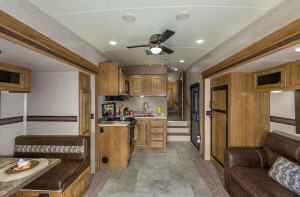 View All Keystone Hideout Fifth Wheel Floorplans! Why we recommend the Keystone Hideout fifth wheel: The sheer amount of floorplans combined with the near 5-star rating on our and other review websites makes the Hideout a no-brainer choice here. 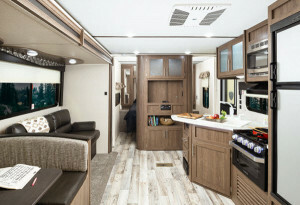 The only floorplan, the Hideout 262RES is just shy 31 feet, but if you’re a bit more flexible on the length, you can also go for a lot of other floorplans that add more room and sleeping capacities! 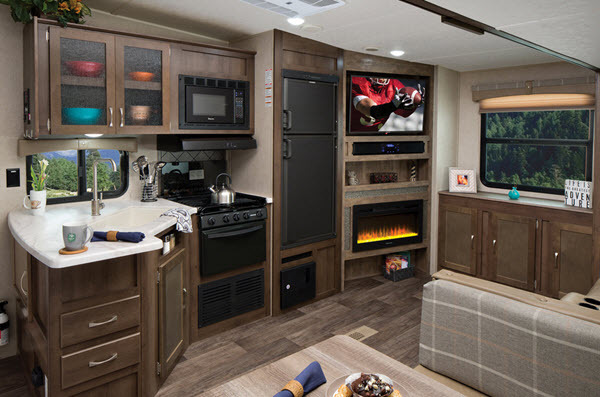 The North Point sports a surplus of features that make it great for tailgating, such as the exterior kitchen, dual marine grade speakers and exterior grill. But if you plan on staying cozy indoors, the electric controlled fireplace with thermostat will keep you warm while you enjoy watching some TV in superb quality thanks to the stereo sound bar. 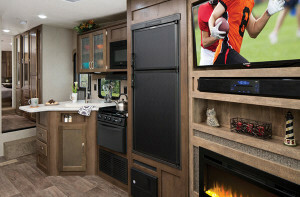 You can make it even better with a lot of expansions such as a 18 cubic foot refrigerator, furrion backup camera, dual pane windows and many others! Because a lot of these campers are also 27-29 feet long, you won’t have a lot of problem when traveling in different states as 27 feet is that sweet spot where you can camp in almost any campground across the country! Share with us your favorite short fifth wheels under 31 feet in the comments below!